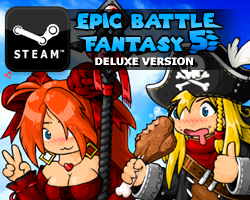 EBF3 Store Page is up! The “Coming Soon” Store page for EBF3 is up, so you can add it to your wishlist or whatever and remember to play it in two days! It’s been approved and tested and it’s ready to go, so I’m just gonna take it easy and relax until then. You could also just go and play it on Kongregate right now instead. This entry was posted in Epic Battle Fantasy 3 on August 30, 2016 by Matt Roszak. 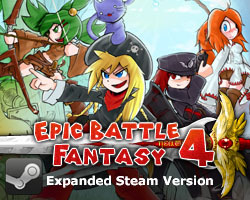 Thank you Matt for putting EBF3 on steam.